Happy International Women’s Day! Women have often been overlooked in Canadian history narratives. Here are three profiles of local women who don’t fit easily into our understandings of pioneer women to make us reflect about women’s roles in the history of our area. The information in each of the profiles was found in Heritage Park’s archives, which includes oral histories, photographs, and maps about Terrace and the surrounding district. Life in Terrace (population 351 in 1931) was much rougher than May was accustomed to in England. She assessed the well situation at her new home on Graham Avenue and quickly realised that she would not be able to care for her long hair. She cut it off right away, and kept the locks for her future grandchildren. May’s hair was donated to Heritage Park Museum recently be her grandson. With no bakery, May taught herself to bake bread from the recipe on the back of a tin. She surprised herself with a beautiful loaf of bread, and began a lifelong love affair with baking bread. She used to secretly break up loaves of bread to feed to the chickens, so that it would go faster and she could bake more. Edgar Cole had arrived in the Terrace area in 1910 as a missionary. His territory stretched from Hazelton to Port Simpson. He became close friends with Chief Walter Wright, the narrator of Men of Medeek, who would travel up the Skeena River every November eleventh to observe Armistice Day with the Coles. Edgar’s experience on the front lines in the First World War shook his beliefs, and he never returned to missionary work after the war. Instead, Edgar returned from the war to work in a sawmill. He made twenty-five cents an hour as a shingle sawyer and thirty cents an hour when he worked on a machine. During the Depression, Edgar had to keep taking lumber instead of wages, since there was no cash. May states in an oral interview that he never saw their five children, due to working long hours in the mill. May gardened, sewed curtains from flour sacks, made mitts out of the tops of old socks, dug the chickens out of the snow, and kept her house warm, at great effort. She grew over fifty fruit trees, including apple, pear, plum, and cherry trees. She found time to celebrate special events like Dominion Day (now Canada Day), and befriended other English war brides. Much of the information in this article is derived from an oral history with May Cole, who was interviewed by Marilyn Crombie and Neil Weber in October 1978 for the Terrace Mini-Museum, which was in the lower level of the Terrace Public Library. Transcripts of the interviews are now stored in the archives of Heritage Park, but we are always on the lookout for the original audiocassettes. 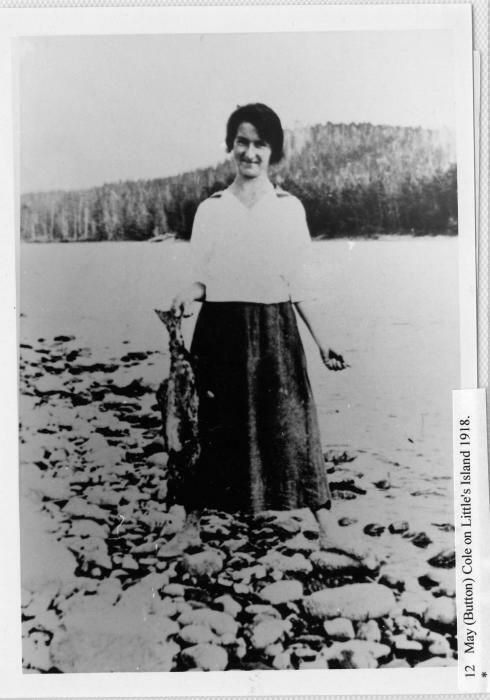 Eliza Thornhill (nee Wright) was a Gitselasu woman whose trapline edged Sockeye (or Eliza) creek and went into what is now Jackpine Flats. Eliza was the sister of Walter Wright, the chief who narrated Men of Medeek. 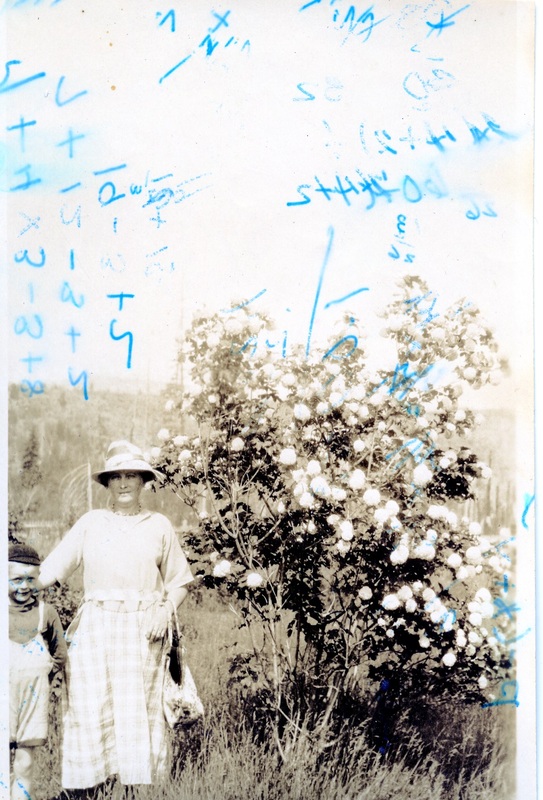 Eliza met English blacksmith Tom Thornhill when she was working in the hop fields of the Fraser Valley in the 1880s. They married in 1891, and pre-empted land in 1892 in what became Thornhill, at the land between the Old and New Bridges. As a First Nations woman, Eliza would not have been eligible to claim land through the pre-emption system. As a British man, Tom was able to claim some of the land she would have been traditionally entitled to hunt and fish. One of the few places in the region named after an aboriginal woman was officially renamed the relatively generic ‘Sockeye Creek’ by 1930, although local usage of the name ‘Eliza Creek’ continued much later. In 1978, pioneer historian Floyd Frank lamented the renaming of the creek, stating that ‘there’s only a few left that know these things.’ Without people to remember her, he implied, Eliza’s story would fade. Reinstating the original name can be extended even further: what would Eliza have called the creek in Sm’algyax, her traditional language? Beatrice, who was also known as May, was well-educated, which was unusual for women at the time. She was born a twin in 1878, to a large, ‘well-to-do’ family in Ontario. She worked in Ottawa (also unusual) until she was in her thirties, when she met Bruce Johnstone while visiting her sister in Victoria. Bruce operated the Lakelse Hot Springs as a rustic health resort, after having pre-empted the land in 1906. Beatrice and Bruce married in 1913. Bruce felt that ‘there was no place for a woman in this north country,’ so he sold the hot springs property and purchased a home in Victoria for his new wife. The deal, however, fell through, and the couple returned to the Skeena region, where they spent the winters in Terrace, and the rest of the year at the hot springs. Their son Lloyd (who later became the mayor of Terrace) was born in Prince Rupert in 1916. The Johnstone family kept around fifteen cows as well as a vegetable garden to feed themselves and the guests at the lodge. Apparently, their garden was much more productive than those of Terrace settlers due to the minerals in the hot springs water. Beatrice occasionally had a part-time cook and waitress to assist her at the hotel, but the rural pioneer life nonetheless must have been an extreme adjustment. She eventually suffered a nervous breakdown as a result of all the manual labour and isolation, and returned to Ontario for three or four years to convalesce. The absence of her labour may have contributed to Bruce Johnstone’s eventual bankruptcy in 1936, though there were other significant factors (the Depression, the flooding of the Skeena, which prevented tourists from reaching the lodge for an entire tourist season, and the calling in of a loan from the estranged widow of a neighbour). ‘It must have been a very lonely life for my mother,’ Lloyd mused in an oral history, much later. Two of these profiles originally appeared in 8 March 2017’s edition of the Terrace Standard.